For those who look forward each summer to the annual performance of the Perseid meteor shower in mid-August, there is some not-so-good news this year. The peak of this year’s display is due early Saturday morning (Aug. 13). But as luck would have it, the moon will be full at that same time. As a result, skywatchers should not expect to obtain meaningful meteor counts. The meteors are called Perseids because they appear to emanate from the constellation of Perseus, which in the predawn hours is high in the northeast sky. These early morning hours are when the meteors themselves occur in good numbers. Unfortunately, the moon, which will be lurking in the constellation of Aquarius, will be the big bugaboo. It will be above the horizon for the entire night and will likely squelch most of the meteor streaks with its bright light. But factoring a full moon into the equation could cause you to only see stars down to about magnitude +4.0, meaning that you might see only about one-tenth the meteors you would without that brilliant moonlight. And if you are handicapped additionally by local light pollution, the number of meteors you might see will drop even more. So you can understand what you’ll be up against if you plan to watch for Perseids on the peak night this year. This doesn’t mean that you won’t see any meteors. As meteor expert Alastair McBeath notes in the 2011 Astronomical Calendar: Perseid "activity should be good enough for some to still survive the moon. Perseids are fast, often bright and frequently leave persistent trains." 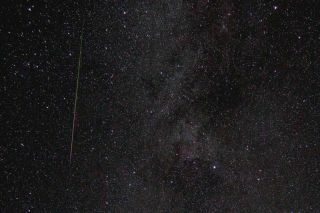 In addition to the Perseids, there are about a half-dozen other minor meteor showers that occur from late July into mid-August, which are relatively little observed, being usually overshadowed by the Perseids. Perhaps these minor showers will get more attention this year, as conditions for observing them are relatively favorable compared to the Perseids. We’ll have more to say about these celestial streakers later this month, so stay tuned!